Arby's features King's Hawaiian burger buns this spring with the debut of three new King's Hawaiian Sandwiches. - King's Hawaiian Big Kahuna: A buttermilk crispy chicken filet, pit-smoked ham, smoked brisket, Swiss cheese, tomato, lettuce, and new pineapple habanero mustard on a King's Hawaiian bun. 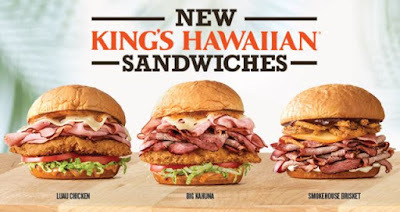 - King's Hawaiian Sweet & Spicy Luau Chicken: A buttermilk crispy chicken filet, pit-smoked ham, Swiss cheese, tomato, lettuce, and new pineapple habanero mustard on a King's Hawaiian bun. - King's Hawaiian Smokehouse Brisket: Smoked brisket, smoked gouda, crispy onions, mayo, and Smoky Q sauce on a King's Hawaiian bun. It's basically the chain's Smokehouse Brisket but on a King's Hawaiian bun instead of a star top bun. 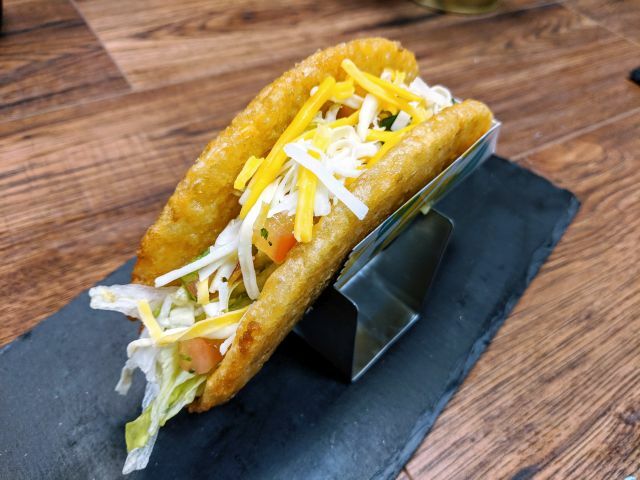 The new sandwiches should be pretty easy for Arby's to implement as, beyond the pineapple habanero sauce, they're made with already stocked ingredients.